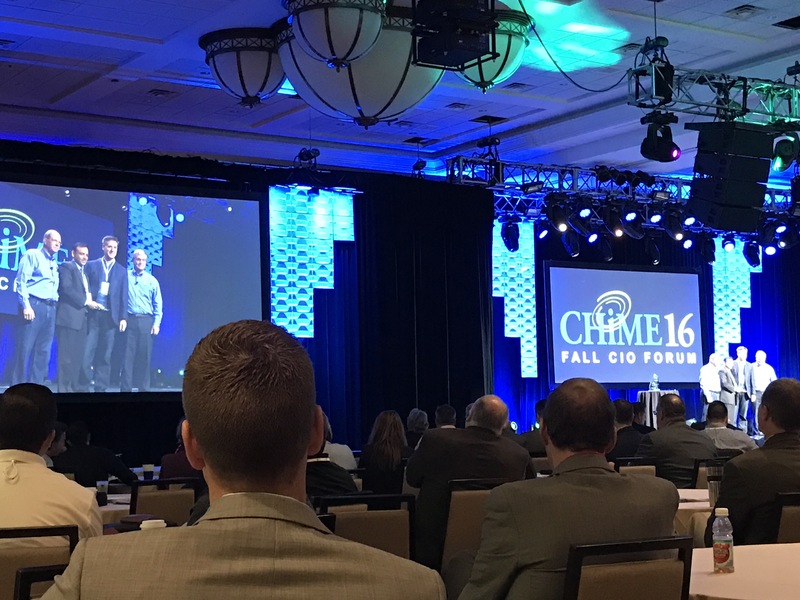 I’m here at CHIME16, the College of Healthcare Information Management Executives, at the fall CIO forum, speaking about Open Notes. I’m honored to be invited to speak, and even more honored to be selected as an Encore by the audience, who choose their favorite presentations for an ‘encore’ presentation on the last day of the conference. And at the end of my talk, a ‘bonus’ presentation on ukulele of “Dear Prudence” by the Beatles, repurposed to illustrate the benefits of Open Notes and the principle of information transparency in healthcare. It has been great to be here in Phoenix learning from and sharing ideas with healthcare’s pre-eminent CIO’s. At this year’s CHIME16, the annual national meeting of the College of Healthcare Information Management Executives, Steve Hess, our CIO accepted the prestigious CHIME collaboration award. CHIME is the largest organization of healthcare CIO’s, over 900 at present count. What a great recognition from Steve’s peers to be recognized in this way. Steve’s work with LeanTaas is groundbreaking in that we now apply machine learning tools to improve scheduling of our infusion center chairs for chemotherapy. Our hospital’s substantial growth has outpaced the capacity of our infusion center. This had resulted in patient dissatisfaction, as well as lots of nurse overtime. Steve worked with Sanjay from LeanTaas to co-develop a scheduling tool that would, with minimal adjustments, dramatically improve throughput using predictive modeling. Peak waiting times dropped by 33%, with no increase in nurse staffing or increase in facility space. Very cool. In particular, the tool can tell the nurses what to expect about their upcoming day, not just scheduled patients, but also anticipated overbooks, and can guide ‘where and when’ to place last minute add-ons to keep things flowing. Really great predictive tool. Now, our opportunity is to use this in our OR, our ED, and throughout our enterprise. This is our first big step into predictive analytics, with clever and effective feedback loops to drive change of behavior. Congrats to Steve. We’re on a great path, thanks to your leadership. I asked one of my patients about this, a few years ago, and he described to me, how, in the “bad old days” as an independent contractor, he would haul a load from Denver to Chicago, drop off, go to the truck stop, and start asking around for anyone who could give him a lead on a load to go back to Denver, and it would often be hours or a day or so of detective work. Indeed, it seemed that Medicine was on its own, the last holdout from the Information Revolution, with Long Haul Trucking leaving us in the dust. Well, that was years ago, and we’ve since seen Meaningful Use, a tsunami of Digital Health startups, the rise of Predictive Analytics for healthcare, machine learning algorithms, and self-driving cars. We are fully into the information revolution in healthcare, with the expected backlash of Physician Burnout, and existential questions of how Computers and Doctors and Patients could possibly ever get along (more on this another time). Meantime, Long Haul Trucking seems set for its next possible disruption: self-driving trucks. With over 3 million truck drivers in the US, is this a mass-extinction event? Mass unemployment? And, what does this next step mean for Medicine? Is IBM Watson (or some quiet future competitor) our OTTO event? Perpend. Our Neurosciences and Stroke team worked with our telehealth program, bought a souped-up ambulance, installed a portable (PORTABLE!) CT scanner, and now we can send this ambulance out on any 911 call that sounds like it may be an early stroke. Unlike current state-of-the-art facilities that take 30-60 minutes AFTER the patient arrives in the Emergency Department to diagnose a stroke, rule-out a bleed, and administer tPA, the clot-busting drug (so called “door-to-needle time”), we now have NEGATIVE door-to-needle times. In other words, we’re driving to the patient, performing the CT scan IN THEIR DRIVEWAY at home, transmitting images to our neuro-radiologist, using a 2 way video link between neurologist and patient, finalizing a diagnosis, and administering life-saving tPA right there in the driveway. BOOM. “Needle” time occurs before “door” time. Watch the video link above for details. So proud of our teams and the technology we develop to support outstanding patient care. Increasingly, I am frustrated and dismayed that one of our presidential candidates had to profess: “I BELIEVE IN SCIENCE.” Has it come to this? Does a democracy necessarily give such freedom as to devolve to the “freedom to be ignorant and believe whatever you read on the Internet”? Over the years I’ve gradually improved the presentations I’ve given, by reading and hearing great speakers. Steve Jobs at Stanford, Barack Obama, Ken Robinson (on education), Jill Bolte Taylor (a neuroscientist’s personal stroke story). And I contrast them with the presentations I’ve heard in college, medical school, from physician colleagues and scientists. And the difference is … STORY (or lack thereof). I believe this is also true to some degree among physicians. Even though all humans think in Narrative, we confuse it with our many meanings of “story.” Scientists demote “story” and “narrative” to second class citizens, in favor of dry statistics and ‘p-values.” WHY? I think it is to the detriment of our purpose: to FIGURE STUFF OUT, to TELL PEOPLE ABOUT IT, and to HAVE IT MAKE A DIFFERENCE IN OUR LIVES. in which the author indicates that there is a way to boil down stories to: one WORD, one SENTENCE or one PARAGRAPH. He also references Joseph Campbell’s The Power of Myth and the Hero’s Journey, and many other time-tested narratives, and claims (very successfully) that story and science belong together, and all of us need both to survive into the future. I hope you get as much out of these as I am starting to (referring to myself as the flawed protagonist, who faces a daunting challenge, and must solve his personal flaws to overcome this challenge; read the book to understand). So cool. Just like learning how human anatomy works in medical school: you never look at other humans the same way again. The Storytelling Culture and the Sacred Bundle from the newsletter Free Range Thinking, written by Andy Goodman, dedicated to improving Public Interest Companies. The Sacred Bundle, for example, describes how American Indian tribes would constantly relocate. At every new temporary settlement, the chief would carefully unwrap the cloth sack, gather the tribe around him, and take out objects from “the sacred bundle” one at a time. He would hold each one up: “this stone was from the river where our tribe first came together.” And he would tell that story. “This feather was from the head-dress of our bravest warrior. He died protecting …” and so on. This retelling at each new location made that settlement home, and the common knowledge ran through the tribe, and all members grew to know it by heart. What an incredible, simple thing. I am striving to create this sacred bundle, for our large and growing organization. In our Digital age, is it sufficient to have a “virtual” sacred bundle? Do we need physical, tangible objects to remind us from whence we came? Can storytelling save science and healthcare? Storytelling in science, good or bad idea? I was once reprimanded by the daughter of a patient, who called me after our visit with her father. I had casually remarked “What a fascinating story!” in response to a long, involved recounting of his illness, his travels, his experiences with other healthcare providers, ending with his visit to my office. I had thought this was a kind reflection of his efforts to stay healthy. Instead, his daughter informed me later, My Dad thinks that you don’t believe him when he tells you things. It gave me great pause. The word “story,” to my patient, implied that his narrative was fabricated. I never used that word in the exam-room again. I’m coming around to the idea that this is not only untrue, it is harming science. The universe is made up of stories, not atoms. I’ve been devouring books and online treatises on this topic. More on this in BLOG 2 of STORYTELLING IN SCIENCE next week. Author CT LinPosted on October 14, 2016 October 12, 2016 1 Comment on Storytelling in science, good or bad idea? In this incredible, short letter, a young man reminds us what outstanding healthcare is all about. Caring not only for our (sometimes critically ill) patients, but also their spouses, their families, sometimes even their cat! Don’t miss this. This puts into perspective our efforts in Healthcare Information Technology. In my view, the world is changing quickly. Technology improves. Software improves. Regulations … well, don’t improve, they change, they increase. Someone said Change is easy, until you change something I care about. Yes. So often, our EHR efforts are met with resistance. We are often the face of Change to our physicians and nurses. We should remember, this letter links us back to our common goal, caring for patients, easing their suffering. I recall hearing the saying, in healthcare: To cure sometimes, to relieve often, to comfort always. Others have written about the 20 percent physician (caution: huge 100+ page pdf), and I have had my worries about IBM’s Watson or other machine learning devices coming to take my job. In my ideal world, the perfect EHR works behind the scenes to improve quality, safety, but otherwise disappears, and allows human connection and caring. This is our aspiration. Thank you Peter DeMarco, and your wife, for reminding us of the best of ourselves.